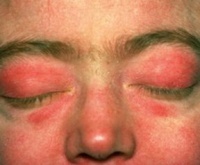 Dermatomyositis is characterized by a rash accompanying, or more often, preceding muscle weakness. The rash looks like patchy, bluish-purple discolorations on the face, neck, shoulders, upper chest, elbows, knees, knuckles, and back. Some people may also develop calcium deposits, which appear as hard bumps under the skin. The most common symptom is muscle weakness, usually affecting the muscles that are closest to the trunk of the body. Eventually, people have difficulty rising from a sitting position, climbing stairs, lifting objects, or reaching overhead. In some cases, muscles further away from the trunk of the body may be affected later in the course of the disease. Problems with swallowing (dysphagia) may occur. Occasionally, the muscles ache and are tender to the touch. Affected individuals may also feel fatigue and discomfort and experience weight loss or a low-grade fever. Another physical finding in dermatomyositis is the "machinist hands" with cracking and fissuring of the distal digital skin of the fingerpads. 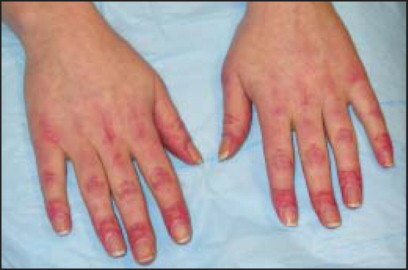 • Women are affected by dermatomyositis twice as often as men. • These diseases occur most often in children between the ages of 5 and 15 and in adults between the ages of 50 and 70. - the body’s immune system makes a malfunction with these diseases the immune system attacks healthy tissues. -What triggers this process is unknown. Although there`s no cure for dermatomyositis, treatment can improve your muscle strength and function. The earlier treatment is started in the course of dermatomyositis, the more effective it is, leading to fewer complications. Corticosteroids are widely prescribed, but it has many adverse effects. These medications suppress your immune system, limiting the production of antibodies and reducing muscle inflammation, as well as improving muscle strength and function.